Hey, remember when VE was here all the time and the gnomes caused all that mischief and life was good? Yeah...I'm still around, still not motivated, still too busy living life. 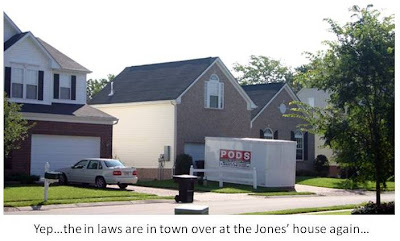 For example, I have a running joke with the wifey-poo that every time I see a "Pods" storage thing sitting outside a house, I say, "Oh, their inlaws must be in town..."
Have you noticed that the number of service people is directly proportional to how busy a place is? For example, we were at the movies the other day during an off time; hardly anyone was there...but the same with the ticket sales people. Only one damn ticket sales person for this ridiculous 20 mega movie theater! Go on a busy time and sure, they have three or four sales people but there's 100 more people in line too. Same goes with my supermarket. I go when it is busy and there are a lot of checkers but too many people waiting so I go when it is less busy and guess what? One checker! I even went at like 2am once and guess what? NO CHECKERS! I had to find the guy because he was busy stocking the aisle. I usually go shopping late at night and it is not bad. But I have also found that if you go shopping at a lot of places just before it is closing time then whoa, they get you out of there so fast, you do not even know what hit you. Same thing goes for seeing the Doctor, especially Urgent Care. Instead of waiting for 3 or 4 hours, you are done in less than an hour. But then again your chances of getting misdiagnosed are also increased but so far it has all been good. Oh and the same goes for the Pharmacy. But ssshhhh, don't let this secret out. And right now would be a good time to visit my website, if you are up to visiting, I have a banned commercial on there that you might like. It's just right for you. Hope you visit here a little more and thanks for letting us know you are doing great. 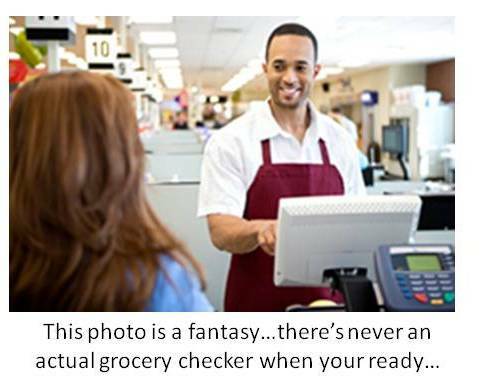 I always pick the wrong line at the grocery store or the movies or the bank and so on. When I get in that queue it's the shortest but then, for some reason, my line moves the slowest. What's up with that. It's like one of the great mysteries of the universe. Yep! Although, most of the time, my theories about not busy times pan out. Fortunately. Life has a habit of getting in the way eh? Ha our shops shut at 11 so no go zones at 1am (I am however waiting for a Californian to finish his early morning shopping before coming on Skype). Pods? Aren't they nice little chocolatey biscuity things. Must be an Antipodean thing. mrsupole - The other approach you can take is to phone in a bomb threat right before you head to the store. Saves on a lot of needless waste by clearing out the store! sybil - Well if that is the case, you should try your theories in Vegas too! baino - Chocolate biscuity things? What are you doing down under that you aren't telling the rest of us? I sure do remember those days. I'm glad I don't have in-laws. Mostly you, 'cos I'm chicken. I'm back now - where have you gone??! !